Luke and Lucas are wildly popular. Luca is catching on. But what if you prefer your boy names a little longer? Thanks to Brittany for suggesting one that might satisfy. Our Baby Name of the Day is Luciano. Luciano is found in Italian, Portuguese, and Spanish, as a form of Lucianus. Lucianus is yet another Roman family name, this time derived from Lucius, ultimately from the Latin lux – light. There was a Saint Lucius in the third century, as well as a trio of popes, and plenty of notable Romans by both versions of the name. 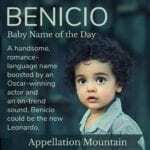 With names like Leonardo and Santiago in favor, it’s easy to imagine Luciano catching on. Of course, the association that many make with this name isn’t exactly positive. Lucky Luciano was born in Sicily, immigrated to New York City while still a child, and went on to become a major figure in organized crime in the United States. Like many a mobster and Mafioso, Lucky often appears as a character in television and movies. Christian Slater played a young Lucky in 1991’s Mobsters. Vincent Piazza played him in Boardwalk Empire from 2010 through 2014. From Jesse James to Clyde Barrow, outlaw names often fare well, especially as fictionalized accounts of their lives paint them as rebellious antiheroes. Another powerful figure associated with the name is Italian operatic tenor Luciano Pavarotti. Few opera singers have become household names, but Pavarotti remains well-known, nearly a decade after his death. Born to a poor family in Italy in 1935, by the 1960s, he was signing professionally. 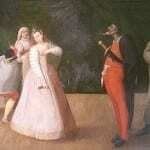 As one of the Three Tenors, he became an in-demand international act. His albums sold successfully, and he scooped up Grammys and other awards over the course of his long career. 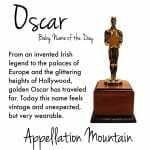 Later in life, his philanthropic efforts were also lauded. Pavarotti was especially involved with the Red Cross. The gangster and the tenor make this name feel especially Italian, but it’s also heard in Brazil, Venezuela, and Argentina. In the US, it’s been in sparing use for years, dipping in and out of the US Top 1000 throughout the twentieth century. Beginning in the late 1990s, the name started a steady climb. At #568 in 2014, it’s currently at its most popular ranking ever. Luke, at #28, as well as alternate spellings Lukas and Luka. All three gained in use between 2013 and 2014. Lucas, the most popular of them all at #18 in 2014, as well as Luca, Luciano, Lucian, and Lucca. Again, all of the Luc- names are gaining. For girls, there’s Lucy, Lucia, Lucille, and Luciana – yet again, four names that are all on the upswing. And, of course, names ending in ‘o’ also feel quite stylish in 2015. 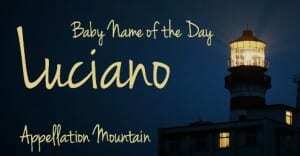 Overall, this makes Luciano a name that is both elaborate and nicely wearable. It can shorten to Luke or Luca without difficulty. But in an age where kids answer to Sebastian and Isabella in full, there’s no need. If you’re looking for an Italian heritage choice, or perhaps a romance language name that works well in the US, but isn’t too common, Luciano is one that works beautifully. 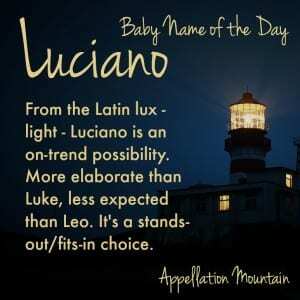 Do you prefer Luke, Luca, Lucian, Luciano, or some other Luc-/Luk- name?